Injection therapies provide a safe and non-invasive alternative to surgery. 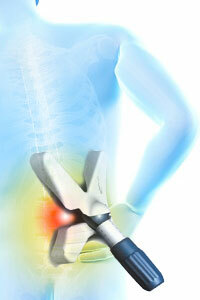 MILD® Procedure for Back Pain is a safe, minimally invasive outpatient procedure. This procedure targets the true problem of lower back pain caused by spinal stenosis. With a proper and prompt diagnosis, the treatment of the affected area will typically allow most patients to resume normal activities and return to work in a relatively short period of time. A condition resulting in narrowing of the spine is called Lumbar Spinal Stenosis. This most often occurs in aging patients where the spine begins to narrow due to bone spur formation, arthritis, thickening of the spinal ligaments, and possible bulging of spinal discs. Typically, symptoms include back pain and sciatica, resulting in pain in a leg, with possible tingling, numbness, and weakness. Small pieces of bone and excess ligament tissue will be removed through a tiny incision in your back by a doctor specially certified to perform MILD®. This is facilitated by the use an imaging machine and specialized tools. Thousands of patients have had the MILD® procedure performed successfully to restore space in the spinal canal. The results are the reduction of compressed nerves and pain and restored mobility.